The NHS is turning 70 this year and what better way to celebrate one of the nation's most loved institutions than with a cup of tea? But this will be more than just a regular brew. 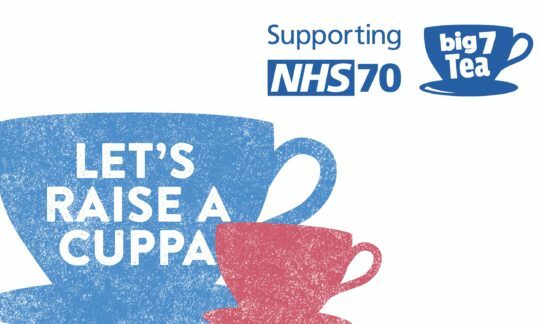 On and around 5th July, people up and down the country will get together for the NHS Big 7Tea to raise a cuppa to our beloved NHS and raise funds for NHS charities. The NHS has touched us all and this is great opportunity for our residents to be a part of the 70th anniversary. Whether you decide on a full on tea party or to simply bake some cakes and ask for donations, the downloadable party pick gives you everything you need to hold the perfect party at your care home. Bunting and all! The 130 NHS charities behind the NHS Big 7Tea span the length and breadth of the UK. You can search for yours here. They raise vital funds above and beyond what the NHS alone can provide, touching lives and making a huge difference to millions of people when they are at their most vulnerable. See these FAQs if you have any questions or would like to contact the NHS Big 7Tea team.